Had you been living in Port in October 1916, you would have been very aware of the referendum on conscription that was looming on 28 October. Campaigning was intense. It is also very likely that you would have known, or known of, Annie Samson. 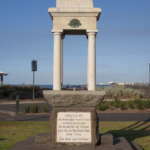 She was the Honorary Secretary of the Port Melbourne Branch of the Political Labour Council. And this was just one of her extensive voluntary commitments. Her husband George was to enlist in January 1917. Annie was very active in the anti-conscription campaign. Each week anti-conscriptionists were invited to rally in Pool St near Bay St. As Honorary Secretary, she signed notices convening meetings and gatherings to ‘canvass Port Melbourne to secure a record vote against conscription’. On 20 October, a women’s open air anti-conscription meeting at the Lagoon was upstaged by Councillor Arthur Page who brought along an effigy of the Prime Minister, Billy Hughes. 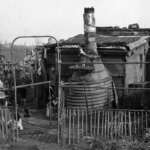 It was reported that ‘he handed the dummy, which had been saturated with kerosene, over to a crowd of small boys who to the accompaniment of loud yells, set the effigy on fire’. The referendum was conducted with a decorum that seemed to surprise observers: ‘an entire absence of anything reprehensible, and especially so in Port Melbourne’. The NO vote in Port was an overwhelming 4,459 with 1,608 voting YES to the referendum question. Yet on this very day, 19th October, just one year later, Annie Samson was murdered by her foster brother, Joe Budd, as she lay reading in bed. Her throat had been cut so badly that her head was almost severed from her body. Budd, a veteran of the first day of fighting at Gallipoli, had hidden inside her house at 127 Princes St while she was out at a meeting. Read the full story of Annie Samson uncovered by Terry Keenan in his book Welcoming the Wounded Anzacs. 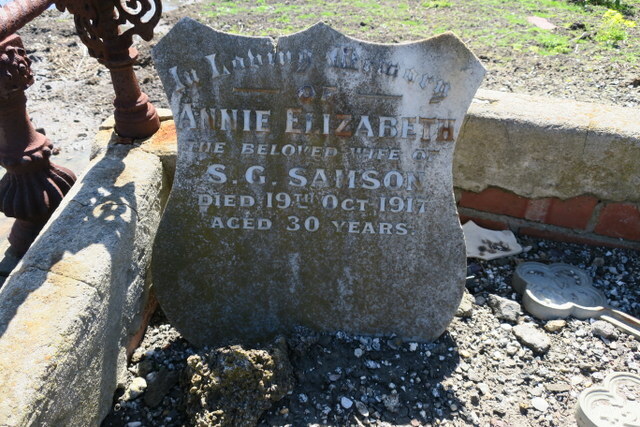 Annie Samson is buried in the Williamstown Cemetery.